Lost in the shuffle of all of the superhero news from Hall H is Matt Reeves’ Dawn of the Planet of the Apes … which is unfortunate, because the footage shown during the 20th Century Fox panel was actually very impressive. But when you drop a footage reel minutes before the ENTIRE cast of X-Men: Days of Future Past takes the stage … yeah, you are kind of going to get pushed back into the shadows of online press coverage. At least for a few hours. So, let’s circle back around to Apes, which shared this disturbingly intense shot of Caesar in the wake of the movie’s Hall H panel. This shot, this stare down, was a big part of the teaser footage, which explains that the plot of the new film takes place eight years after the conclusion of Rise of the Planet of the Apes. We get a screaming monologue from Gary Oldman explaining that mankind spent four years fighting off the virus that was infecting our planet (unleashed at the end of Rise), and another four years fighting each other … leading to the near decimation of the human race. And then we see our ape leader. The shot begins tight on his eyes, and slowly drifts back. Caesar, played by Andy Serkis, never looks away. He grunts, and puffs out his breath. He’s wearing ceremonial war paint on his face. And as the camera pulls back further, we continue to see more and more apes hanging in the trees around him. The clip comes to an end. Reeves took to the stage in Hall H on Saturday to say that they are really trying to get the audience to connect to the apes in his sequel, to “find your inner ape.” He said that humans have a smaller part in his sequel, which means he’ll be able to lean on Serkis. Good choice. The actor, meanwhile, explained how much deeper into Caesar’s conscience he has been able to drift, even though they are still filming on the sequel and they still have a while to go. Reeves also said that while they wanted to show Comic-Con plenty of apes, WETA needs time to properly develop them. 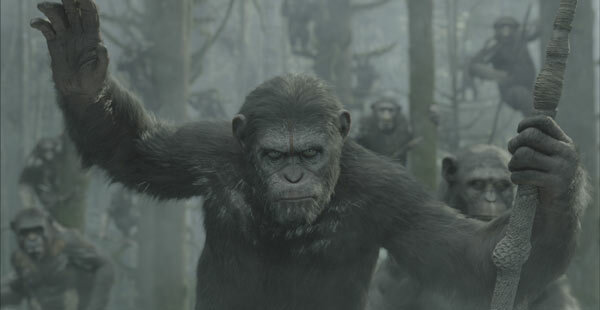 Well, they have until July 18, 2014 to whip Dawn of the Planet of the Apes into shape. The sequel stars Oldman, Clarke, Judy Greer, Keri Russell and Serkis. Hopefully we’ll see some version of this footage online soon, but a trailer, at the very least, should drop before year’s end.